Built in 1998, 60 x 131 lot, 4 bedroom, 3 bath, unfinished basement on the market for 4 days. Sold in 2011 for $790,000. Listed for $890,000 and sold for $884,500 this year! Listed for $269,900 and sold for $292,000 in 4 days. Estate sale, home in need of updating and sold in "As is" condition. 58 x 185 lot. 3 bedroom, 2 bath. Listed for $419,900 and sold for $415,000 in 3 days. 3 bedroom, 2 bath, 2 car garage on 49 x 215 lot! Listed for $389,900 and sold for $383,000 in 12 days. Built in 1954, 58 x 150 lot, 3 bedrooms plus one in basement, 2 1/2 baths. This home sold in December of 2007 for $277,500. At that time it was being offered in As Is condition and being marketed as a teardown. It had been completely redone and included a new garage in 2010. Walk to town and train. Brick ranch on 50 x 212 lot. Listed for $370,000 and sold for $345,000 in 22 days. 2 bedrooms plus one in basement, 2 baths, unfinished basedment. Home needs updating. Listed for $599,000 and sold for $545,000 in 14 days. 50 x 173 lot, fixer upper built in 1926 in need of some repairs and being sold as is. 4 bedroom, 3 bath. On the market for 156 days. Listed for $899,000 and lowered to $829,900 and sold for $784,000. Previously sold in July 2010 for $725,000. Built in 2004, lot 50 x 151, 4 bedroom, 4 1/2 bath with a finished basement. 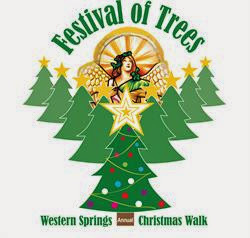 Don't miss the first two day Christmas Walk in Western Springs. 5:30-8:30 on Friday and 1-6 on Saturday. For more information visit the Village of Western Springs website.